Our company has set benchmark in presenting Identity Verification. Known as a reputed firm, we are engaged in offering Verification Service. Integrated with Aadhar Verification System which reduced the KYC risk of members by automated process of verification with thumb recognition or by Aadhar number. With the increase in fraud, it becomes very important to authenticate the originality of the identity proof given by the candidate. At V VERIFYY, we check for the genuinity of the ID proof, by doing a thorough verification. 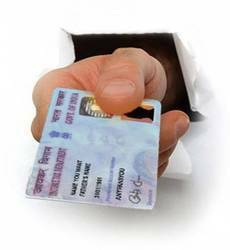 We verify the identity documents of the tenant from the respective issuing authorities, for eg. PAN verification from the I-T Dept. Aadhaar verification from the UIDAI (Unique Identification Authority of India). In response to the lack of documentation and valid identity proof among migrant workers, Aajeevika Bureau offers a comprehensive registration and Photo ID service. The Photo ID is an immensely popular offering and well over a thousand cards are issued every month to migrant workers. - Assessments of high maturity practice implementation for a period of six months. - Institutionalization of the modified processes. - Evaluation of Organizational Innovation Deployment. The IDB (International Database) check comprises of a series of search run through prominent India and global database, through a unique tool specifically designed by Verifacts; which picks up live data from the web site of various criminal, regulatory and compliance data base. Today we live in a world of high costs and expenditure. With the ever increasing cost of living, doing any type of high capital investment like building a home, purchasing a vehicle or for our children’s higher education, we generally apply for a loan. KeyLink aids organizations to reduce potential losses to and protects their business interests. Pre-employment Screening: Verification of experience, skills as well as background to ensure that aspirant credentials are authentic. Source: India Income Tax Department. Confirms valid, not expired, and matched to candidate identity. Legal spelling result from India Tax Dept. for misspelling crosscheck. Also confirms location of issuance for criminal search location crosscheck. The authenticity of the identity proofs are verified. Verification Services for Telecom and Banking Sectors.